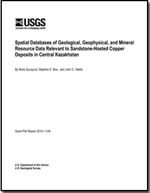 Spatial Databases of Geological, Geophysical, and Mineral Resource Data Relevant to Sandstone-Hosted Copper Deposits in Central Kazakhstan; 2010; OFR; 2010-1124; Syusyura, Boris; Box, Stephen E.; Wallis, John C.
Central Kazakhstan is host to one of the world's giant sandstone-hosted copper deposits, the Dzhezkazgan deposit, and several similar, smaller deposits. The United Stated Geological Survey (USGS) is assessing the potential for other, undiscovered deposits of this type in the surrounding region of central Kazakhstan. As part of this effort, Syusyura compiled and partially translated an array of mostly unpublished geologic, geophysical, and mineral resource data for this region in digital format from the archives of the former Union of Soviet Socialists Republics (of which Kazakhstan was one of the member republics until its dissolution in 1991), as well as from later archives of the Republic of Kazakhstan or of the Kazakhstan consulting firm Mining Economic Consulting (MEC). These digital data are primarily map-based displays of information that were transmitted either in ESRI ArcGIS, georeferenced format, or non-georeferenced map image files. Box and Wallis reviewed all the data, translated Cyrillic text where necessary, inspected the maps for consistency, georeferenced the unprojected map images, and reorganized the data into the filename and folder structure of this publication.